Middle Bass Island, Ohio, is a 750-acre island in Western Lake Erie. It is shaped like the Big Dipper and located at the heart of a group of 23 islands. Its more famous neighbors are South Bass Island, with the town of Put-in-Bay, and Kelley's Island. Middle Bass Island has a tranquil atmosphere and refreshing natural landscape that lures visitors to its shore for carefree, relaxing getaways. In fact, a number of US Presidents went to Middle Bass Island to fish and enjoy the entertainment offered in the early era. Most of these dignitaries stayed in the "Club Area" of Middle Bass Island, on the west side. The first European explorer, Robert La Salle, found an abundance of wildflowers on the island in 1679. So impressed with these flowers that La Salle named it Isle des Fleures, the Floral Island. Floral Island would remain the name for the next 200 years. By 1875, Middle Bass Island's Golden Eagle Winery was reported to be the largest wine producer in the United States. In 1884, the Lonz family acquired the Golden Eagle Winery which they operated until the death of George Lonz in 1968. 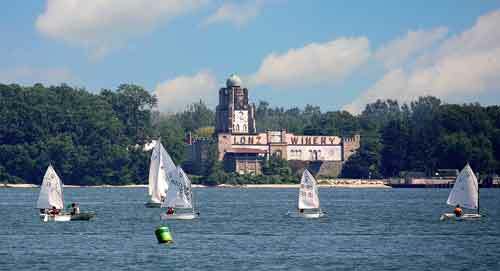 Lonz Winery has often been compared with the wineries of the German Rhineland. The Lonz Winery was placed on the National Register of Historic Places in 1986, and remained popular with tourists until the tragic collapse of a crowded terrace in July 2000. In the winter of 2000 and spring of 2001, the state of Ohio purchased 124 acres on Middle Bass Island, including undeveloped natural areas featuring wetlands, woodlands, glacial grooves, and nearly a mile of Lake Erie shoreline, along with the shell of the Lonz Winery and the marina complex. Middle Bass Island became Ohio's 74th state park in March 2001. The state park on the island is currently undergoing extensive renovations and will be closed until complete estimated to be in 2009. Middle Bass Island was formed during the glacial period when massive ice sheets entered Ohio. Glaciers gouged and scoured the bedrock, and their tremendous weight left deep depressions which filled with meltwater, forming the Great Lakes. Lake Erie, the world's 12th largest freshwater lake, is large in area but shallow, allowing for violent storms with high waves. The western basin, where Middle Bass Island is located, has an average depth of only 25 to 30 feet.